The brain consists of neurons and glial cells. The developmental abnormality of glial cells causes various diseases and aberrant cerebral cortex development. CD38 gene knockout is shown to cause aberrant development of glial cells, especially astrocytes and oligodendrocytes. The CD38 gene is known to be involved in cerebral cortex development. The present study suggests the importance of glial cells for cerebral cortex development. It is essential for brain development that both neurons and glial cells develop in a normal manner not only during fetal but also postnatal stages. In the postnatal brain, neurons extend long protrusions (axons and dendrites) to form complex networks for information exchange. On the other hand, glial cells are thought to support network formation of neurons, to regulate transmission of information, and to help survival of neurons. It is known that more than 50 percent of total cells in the brain are glial cells, three times more than neurons in number. It is also known that in the human brain has far more glial cells than the brains of rodents or primates. This indicates that for the higher functions of the brain, glial cells are of particular importance. In the past, research on developmental disorders of the brain focused on neurons. Recently, however, research has focused on the abnormality of glial cells. There remain a number of unsolved problems concerning the mechanism of glial cell development in the postnatal brain and the relationship of glial cell abnormalities and developmental disorders of the brain. The research team of Kanazawa University and Gunma University has been analyzing developmental abnormalities of glial cells by using various mouse models exhibiting developmental disorders with behavioral abnormalities to get clues about the relationship between developmental disorders of the brain and glial cells. 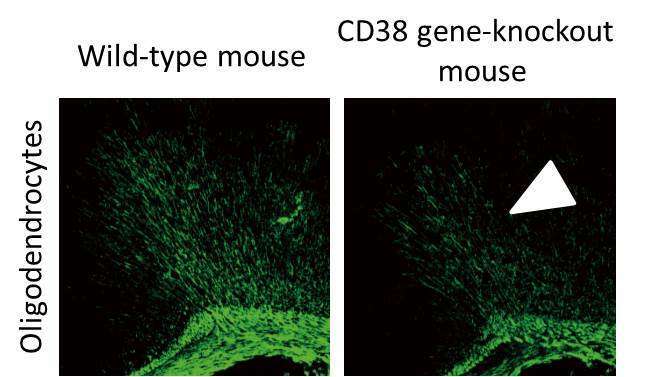 Previously, the research team found that the CD38 gene knockout mice showed social abnormality along with aberrant cerebral cortex development. In the present study, with the CD38 gene knockout mice, developmental abnormality of glial cells has been shown, suggesting glial cell development is important in cerebral cortex development. The research team has found for the first time that the CD38 gene is essential to postnatal glial cell development. More specifically, the team has found the following three points. 1. The glial cells highly express CD38 at the postnatal developmental stages. Tissue sections of the cerebral cortex regions expressing CD38 were examined by in situ hybridization to indicate that the astrocytes in the cerebral cortex at the late stages of postnatal brain development highly expressed CD38. This result suggested a possibility that the CD38 gene was involved in the development of the glial cells. 2. The CD38 gene knockout mice exhibit abnormal glial cell development. 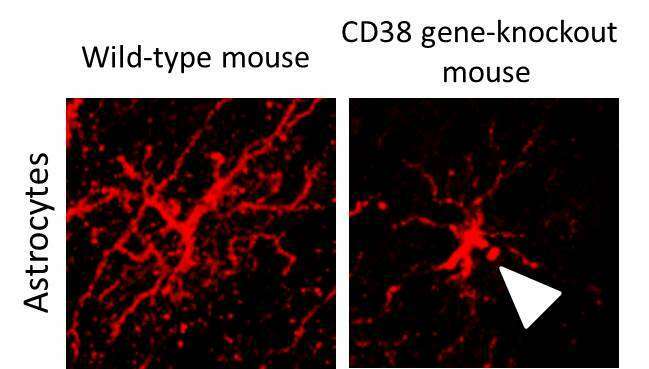 Glial cell development was examined in the CD38 gene knockout mice. The team found retardation of development of glial cells such as astrocytes and oligodendrocytes. This result indicates the importance of CD38 gene in the development of those types of glial cells. 3. The CD38 gene knockout mice exhibit abnormalities in interactions among glial cells. 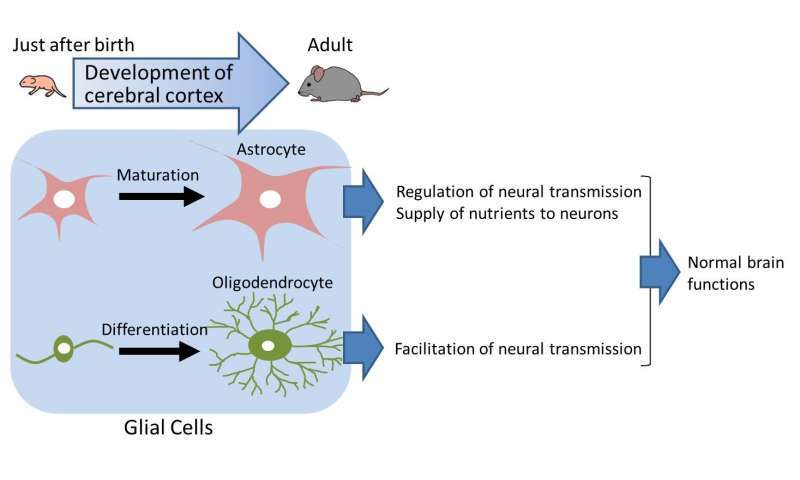 Experiments with cultured cells and/or the CD38 gene knockout mice revealed that in the absence of CD38 gene, abnormalities of the astrocytes resulted, which induced aberrant interactions among cells and developmental disorders of oligodendrocytes. The researchers conclude that the CD38 gene is essential to the development of the glial cells, especially astrocytes, and that astrocyte abnormality induces aberrant development of the oligodendrocytes. While not much research has been performed on the mechanisms of brain development disorders with a focus on glial cell development, the present study emphasizes the importance of glial cell research. By furthering the present study, the scientists expect to learn about mechanisms of brain development disorders such as autism, and possible paths to therapy.